All images copyright © George Woodall and can not be reproduced in any form without written permission. 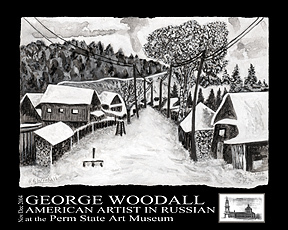 Seattle based artist George Woodall has returned from his first International Museum show at the Perm State Art Museum in Perm, Russia. A frequent visitor to Perm, along with his Russian wife Marina and child Gretta, the artist has developed an international following that created the opportunity to mount a major exhibition of his works. In fall of 2004 George was host to a showing of over 50 works including paintings, etchings, mixed media collage.